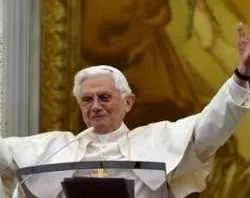 Castel Gandolfo, Italy, Sep 4, 2011 / 01:42 pm (CNA/EWTN News).- Correcting the behavior of those gone astray is an essential part of Christian life, said Pope Benedict XVI in his Sunday Angelus address Sept. 4. The Pope quoted the 4-5th century theologian, St. Augustine of Hippo, who said Christians cannot be indifferent to the “severe wound” a fellow believer may have inflicted upon themselves through sin. If a fraternal correction is rebuffed, said the Pope, then Christians should follow the advice of Jesus - seek the witness of others and, if necessary, the sanction of the wider Church.